About a week ago, my lovely friend Noa Druker shared a picture and a recipe for this lovely pastry, which had me salivating for days. I finally got around to trying to make a GF version of it a few days ago. 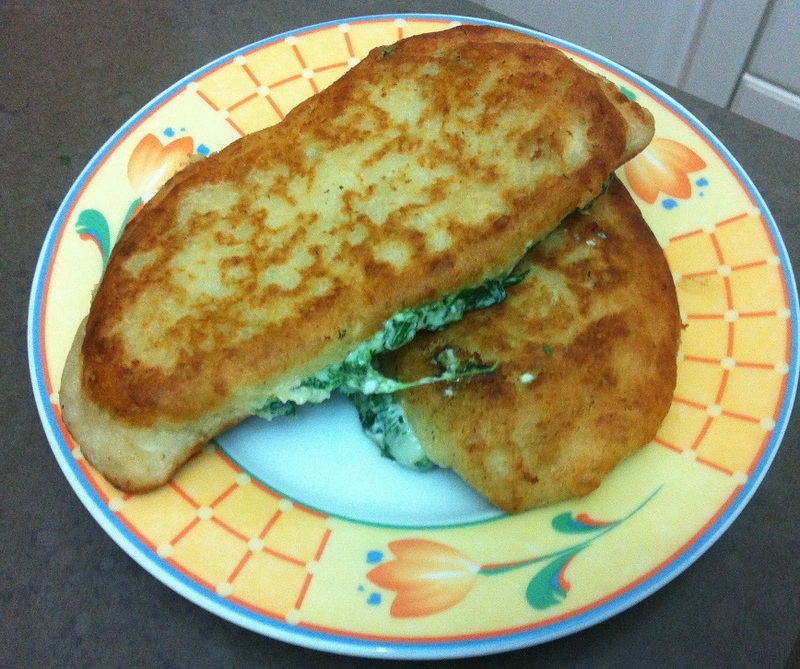 Having just gone back to work and working around a new baby, I copied it wrong, but the result was oh-so-right… So there you have it – my GF version of Gozleme… Now a staple in my kitchen (mandated by my eldest). 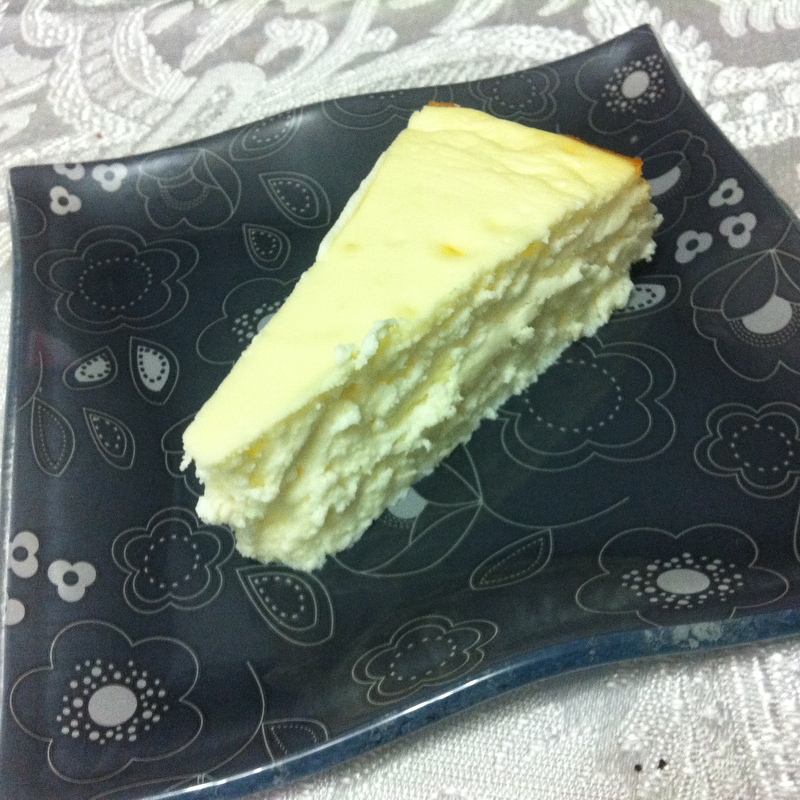 Cheese: 50 gr. feta, 150 gr. hard cheese of your choosing. Yam: 1 medium-sized yam, cooked and mashed – add 100 gr. Kashkaval and season with salt and nutmeg. 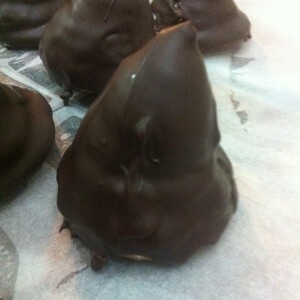 Chocolate: 50 gr. melted butter, 1 tsp. cocoa powder, 2 Tbsp. sugar – mix and let set for 5 minutes. Cinnamon-Banana: mix ¼ cup sugar, ¼ cup Demerara sugar, and ½ Tbsp. cinnamon. Sprinkle over half a circle. 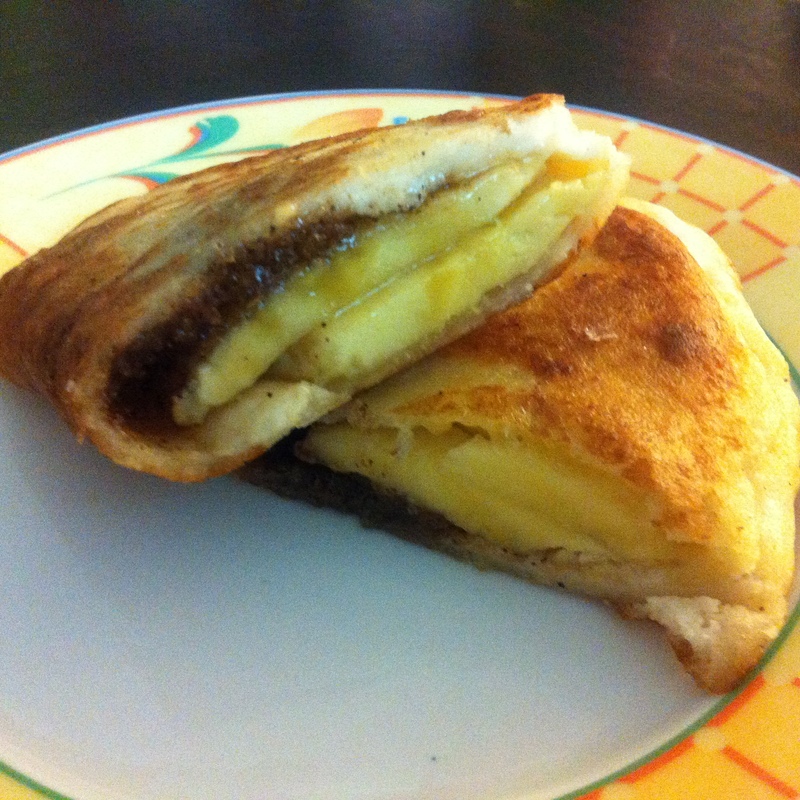 Slice a banana diagonally, and place over cinnamon layer. Put all ingredients in a bowl and knead for 1 minute. Divide dough into 8 equal parts (approx. 65 gr. each). 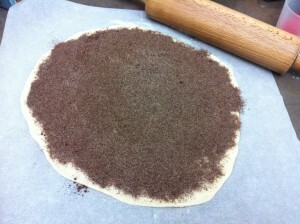 On baking paper, roll each part into a circle, as thinly as you can. 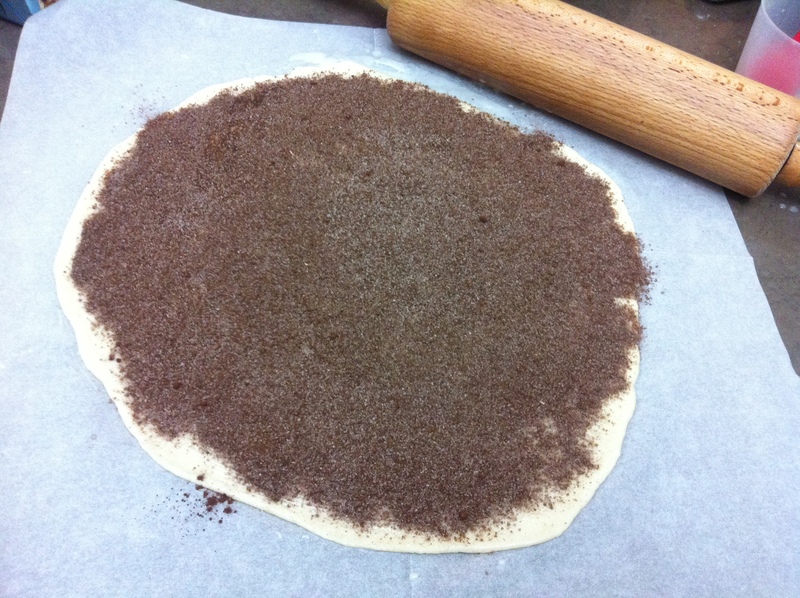 Spread/sprinkle filling generously on half of the circle, leaving ½”/1cm around the edge for closing. Gently fold the empty half over the full one using the baking paper. Close firmly around the edges using your fingers. Heat a frying pan with a little oil (just enough to cover bottom). Fry the gozleme until golden (1-2 minutes), turn over and repeat. 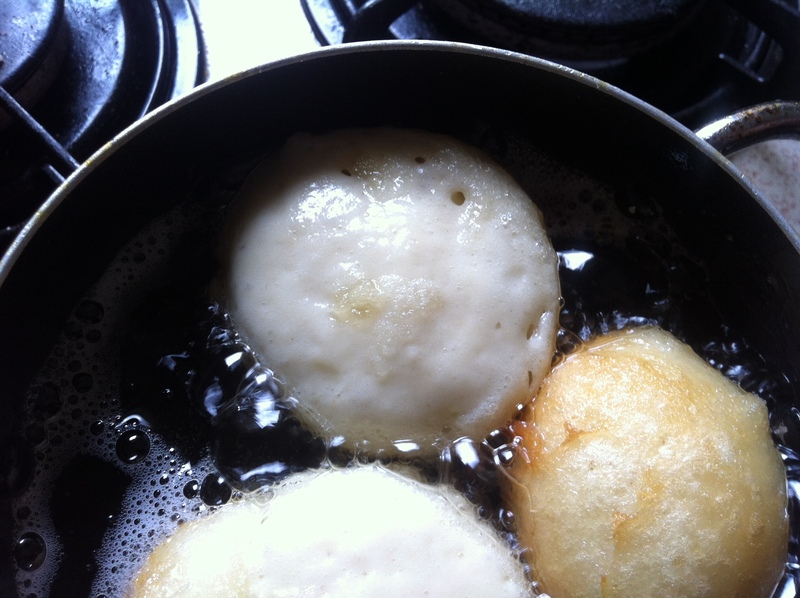 Remove from pan onto absorbing paper. Let cool for 1-2 minutes, and enjoy! Put all ingredients in your stand-mixer bowl, and knead for 1 minute on low – only until the flour is incorporated. Shift to high, and knead for 10(!) more minutes. Form a ball, cover with a plastic bag, and let rise by approx. 80% (approx. 1-1½ hours) . Divide into 3 equal parts (approx. 375 gr. 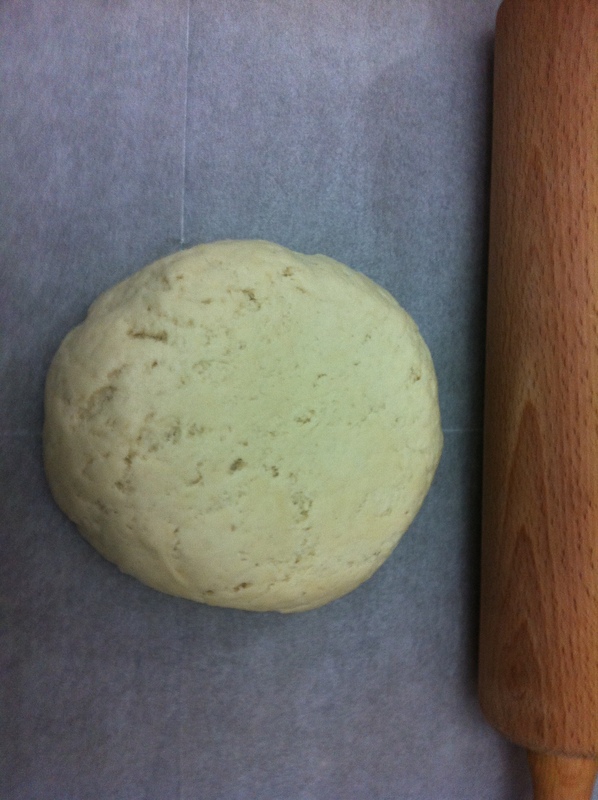 each), knead well and form balls. Line a surface with baking paper. Take first ball and roll into a paper-thin circle. Brush with melted butter/Mazola and cover evenly with chocolate/cinnamon filling. 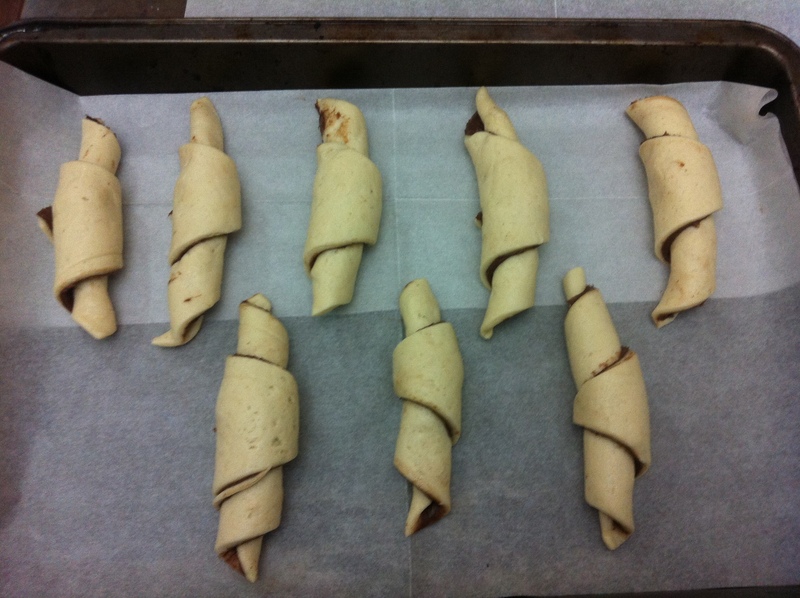 Cut into 8-12 triangles (according to the desired rugelach size). 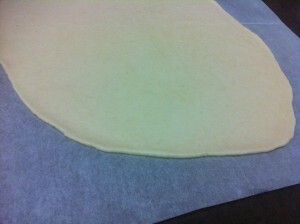 Roll each triangle tightly from the wide part to the narrow part. 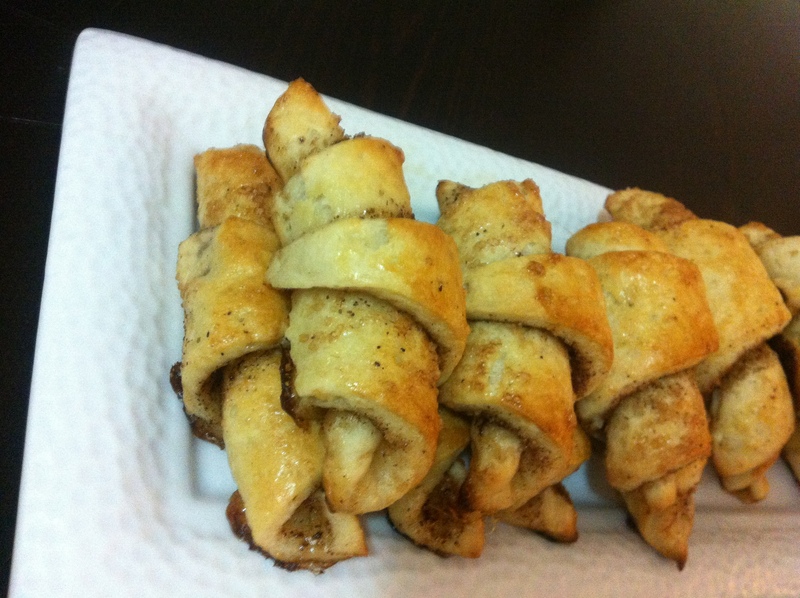 Brush each rugelach evenly with beaten egg. Repeat the above for each ball. Let rise by 30-40% (approx. ½ an hour). Bake for approx. 10-12 minutes until golden-brown. 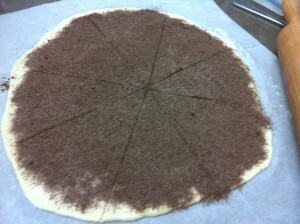 Nutella Filling: 100-150gr. 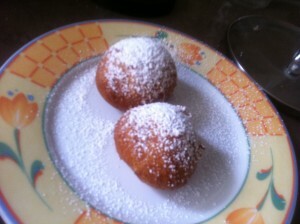 Nutella per dough ball. In a bowl, lightly whisk eggs and sugar. 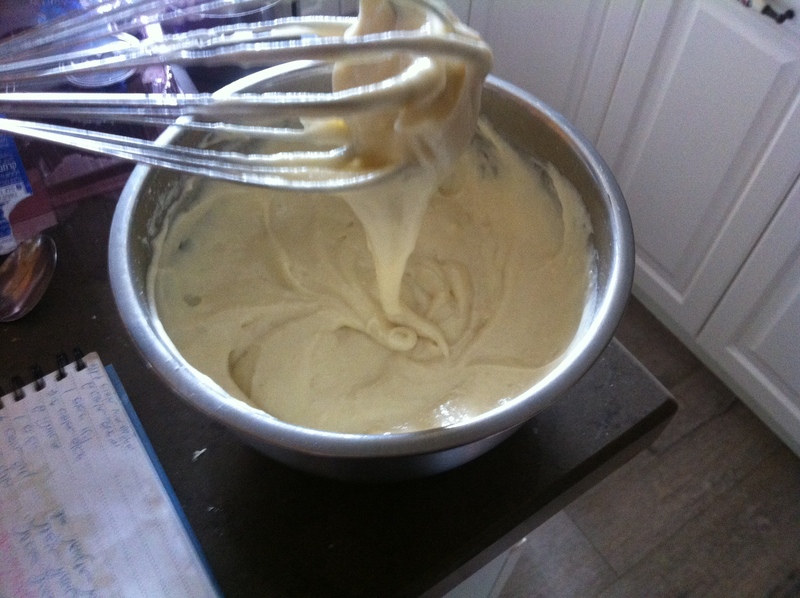 Add salt, oil, yogurt/sour cream, flour, baking powder, Brandy/Araq, and vanilla extract, and whisk until smooth. Heat oil in deep pot to 180C/360F and lower heat to maintain this temperature. Pour 1 Tbsp. 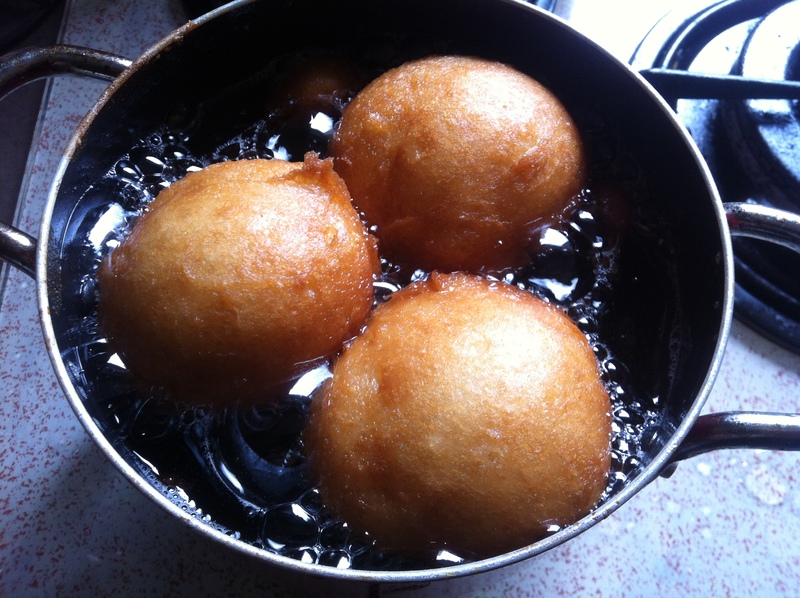 of the batter to the hot oil using another tablespoon. Once bubbles form on top (approx. 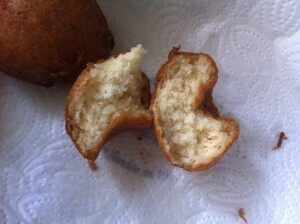 2 minutes), gently flip the donuts using a fork. after two additional minutes, turn the donuts again, give it a minute, and turn one last time for another minute. Remove from oil using a perforated spoon. Serve with your preferred topping(s): caster sugar, chocolate sauce, sprinkles, etc., and preferred filling(s): jam, chocolate ganache, Dolce De Leche, and/or Crème pâtissière. This is the only cheesecake my son likes. 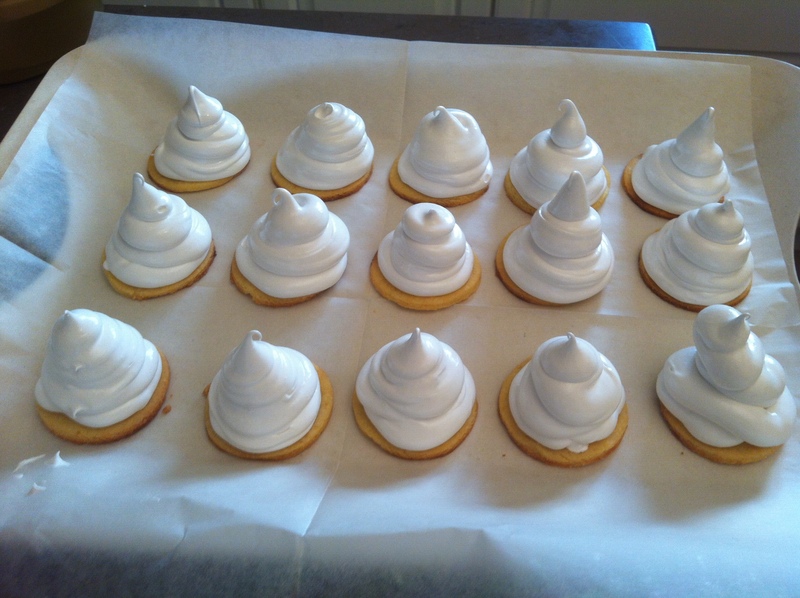 Place small tin with boiling water at the bottom of the oven (to create steam). 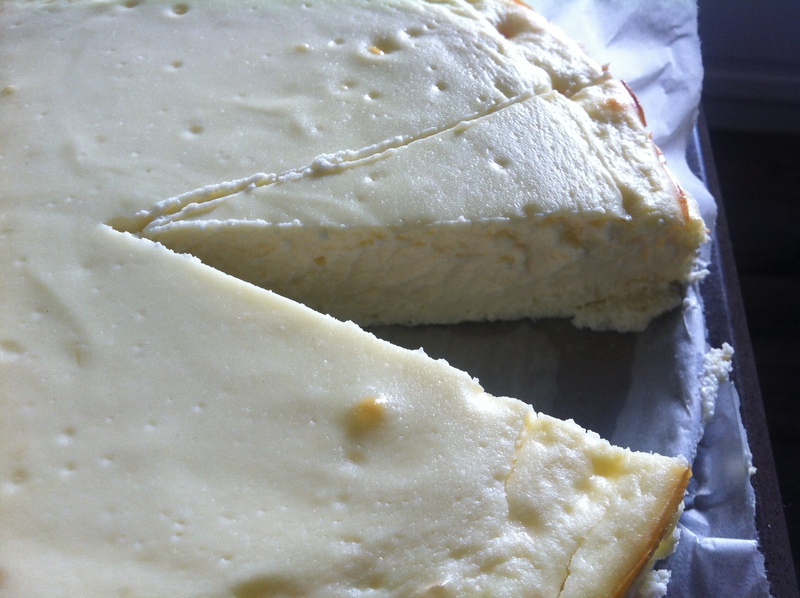 Mix cheese with sugar, and set aside for 5 minutes (for sugar to melt). Beat in the eggs (do not whisk). Add the instant pudding, flour and cornstrach, and mix well until no lumps remain. Line a round tin (24 inches) with baking paper, including sides, and lightly oil. Pour mixture in and bake for 30 minutes until top is lightly golden and stable. Fill a pot with about 2cm/1inch water and bring to a boil. Place a heat-proof bowl over the pot (I use the metal mixer bowl), so that the bowl’s edges rest on the pot, and its bottom is not(!) touching the water (this technique is known as Bain Marie). 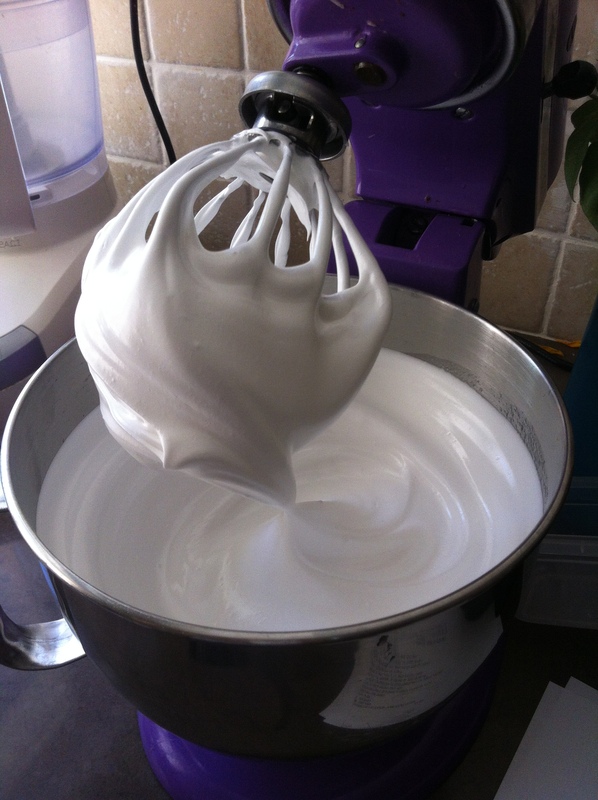 Place the egg whites and sugar in the bowl, and whisk using a beater until the sugar melts completely (take a drop between two fingers and make sure it doesn’t feel grainy). 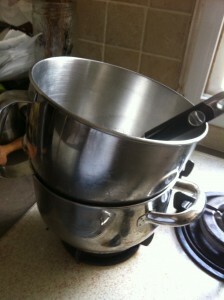 Remove bowl from heat and pour to mixer bowl. 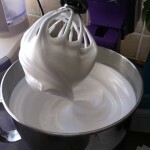 Whisk on high for 10-15 minutes until very thick and glossy. Fill a piping bag with a round tip (nozzle) with meringue. Place your round bases (plain butter cookies, circles cut from petit-beurre biscuits (store-bought or using my recipe), or my Crembo-base cookies) over an oven grid, set over a baking sheet. Pipe a circle the size of the base, building up, each layer slightly smaller in diameter, as shown in the photo below. 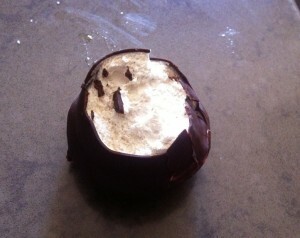 Melt 300 gr. semi-sweet or white chocolate with 1 tsp. vegetable oil (Canola/Corn/Sunflower) – mix well. Pipe the molten chocolate over your Crembos, so that they are completely covered. You can collect and use the unused chocolate from the baking sheet if you need it. You can also cover with semi-sweet chocolate, then melt 1/2 the amount of white chocolate and decorate with it over the semi-sweet chocolate. Cool and store in your fridge.